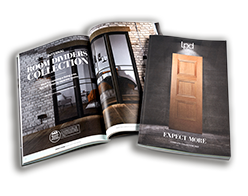 The stunning door sets from LPD offer fantastic looks in any colour or shade. Highly secure, weather-tight and ready fitted into the outerframes, these doors do away with all the fiddly lining up and levelling, ensuring a perfect fit every time. Combined with side and top lights, an LPD door set is easily fitted, weather-tight, and provides stunning looks that will add instant appeal to any home. For further information on these, visit the downloads section for the Composite Door Sets Brochure.